As students take to the streets for a third protest march, we talk to some of those still occupying buildings after the last demonstration. Many University of London students who have occupied college premises since last Wednesday's national protest hope today's Day of Action against attacks on higher and further education will inspire more students nationwide to copy their example. 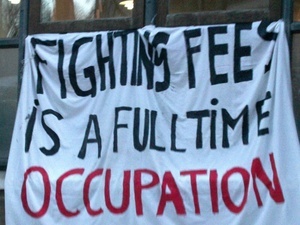 Students at University College, London have been occupying a function room in the Jeremy Bentham building as a base for alternative lectures, debates and workshops – even a dance-off with another occupied university – on how best to oppose cuts to higher education, the creeping privatisation of universities and the proposed massive hike in fees. Singer Billy Bragg visited, even NUS President Aaron Porter, under fire for calling students who occupied the Conservative Millbank HQ on 10 November ‘despicable’, felt under pressure to put in a late appearance. On Sunday, UCL occupiers took their protest to Oxford Street and blocked traffic. On Sunday night, the entire college was covered in chalked-on graffiti and a banner was lowered over the college reading "University for sale". "We'll continue to put strong demands to management and to the government; there's no way we are going to accept these attacks on education lying down. There is more and better to come". This view was echoed by the students who have occupied the Brunei Suite at SOAS for the last three days and now facing threats from management to have them forcibly evicted. Even if that happens – the students were still in negotiations with the college last night – politics student Rosa was clear that 'Something will continue. This isn't going to go away', while Matt pointed out that occupations are happening nationwide, and that by the end of today's Day of Action, we are likely to witness many more.